Beautiful tribute! I am sorry for your loss! So sorry for your loss. What a beautiful story. I too, am so very sorry for your loss. That was a lovely tribute. It’s wonderful when those we love leave behind something tangible with their love imprinted. I think it’s what drives us to continue to be creative and pass it on to loved ones. My sympathies go out to you and your family. What a nice memory you have to hold on to! A beautiful story and I’m sorry for your loss! The stitching is absolutely amazing! Beautiful story and I’m so sorry to hear the news. She seems like a wonderful woman, who meant the world to you and your family. Oh I am so sorry for your loss! My heart goes out to you and your family during this time. You are in my thoughts and prayers. so sorry. strength and peace be with you and your family. I decided to watch a little tv – n-o-t-h-i-n-g is on, pointless, shallow b-o-r-i-n-g. The Vida’s of this world where born a few generations before me! My GRANDmother was also from that sweet perfect vintage! These woman & men valued things in the right order! I’m so sorry for your loss, what an amazing story and piece of her you shared with us today. So, so sorry for your loss! Hugs! I’m so sorry to hear of your loss. What a touching tribute to her skills and kindness. I’m sorry for your loss, always hard when people move on without you. But, a lovely testament to her nimble and artistic hands. I’m so sorry for your loss. What a loving and gracious tribute to a remarkable woman. The embroidery is a wonderful metaphor, too. Someone who was beautiful inside and out. Sending gentle hugs to all of you. I’m so sorry to hear about the passing of a lady that was clerkly special to you. What a great piece to treasure and remember her by. It’s truly beautiful. Savor your time with family and friends celebrating the life of this special lady. Shedding a tear along with you…virtual, warm hugs coming your way……blessings, strength and peace to you and your family……..
Sending you a hug and hope that you let the pain and loss in, otherwise it can’t make way for all the found memories you have. I am so sorry to hear about your mother-in-law. You and your family are in our thoughts and prayers. What a beautiful memento to remember her by! Beautiful story, I am so sorry for your loss. Live fully and loss is hard. Nice that you honor her. Take care. 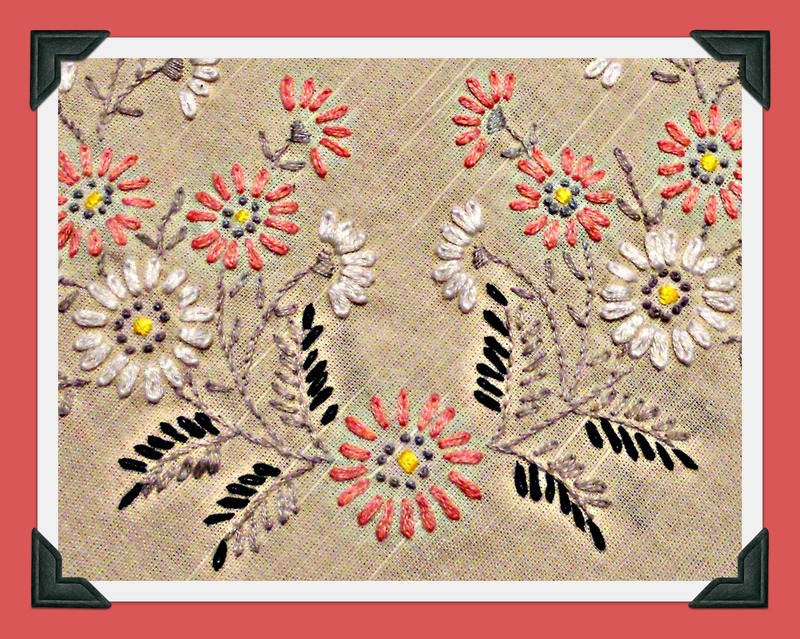 A truly beautiful tribute to your Mother in law and her embroidery skills. Sorry to hear about your loss. So sorry for your loss… So thankful that you shared such a warm, grin-inducing memory. Best wishes and much strength. Sorry for your loss. Will keep you in my thoughts. I love that you chose to tell this story about your mother-in-law – – what a wonderful celebration of her life! And I think it painted a vivid picture for all of us as to her incredible creativity and talent. I hope and pray that in this season of mourning, you and your family can lean on each other for support, and lean on God. Sending up a prayer for you tonight and a great big virtual hug. What beautiful needlework. I have some similar tucked away in my china cupboard that my husband’s grandmother made for us. I am so sorry for your loss. What a beautiful tribute to your mother in law. A delightful story. Sorry for your loss. Very sorry for your loss. Thank you for sharing your beautiful memory of her with us. My heart goes out to you & your family during this time; “Vida” means life in Spanish… what a name! I can only imagine the wonderful soul behind it. I am sorry for your loss. I had a wonderful mother-in-law, and I think of her with the fondest and warmest of memories. Wishing you the same. Q – What a wonderful memory. I’m sure she’s smiling as she’s reading this. So sorry to hear of your recent loss. Vida’s expert needlework is a tribute to her. Everyone time you use this table cloth, she will be with you. From my experience, treasured memories like this will help you as you grief the loss of such a dear one. RIP Ms. Vida! Praying for strength during this time of loss – God bless you all! I’m sorry for your loss, but its lovely to see her spirit so vibrantly alive in her stitches. I’m so sorry for your loss. You’re in my thoughts and prayers. But what a beautiful piece (and a gracious woman)! Thanks for sharing the story. It is very heartwarming to read about daughter-in-law/mother-in-law relationships that are full of love and admiration. Thank you for telling us this wonderful story, and know that I am thinking of you and your family at this sad time. Thinking of you and your family at this difficult time. That is a gorgeous piece of handiwork – one that can be treasured for many years to come. How lucky you are to have a bit of her love for your table. Sorry to hear of your loss, my brother passed away too soon in November, we knew it was going to happen – just too soon. Oh! I am so sorry for you! I am so sorry for your loss – I know it is difficult to lose someone you love so much. What a lovely memory to have and tell every year, I am so sorry for your loss, I will be thinking of you and your family. Sorry for your loss Katherine, what a lovely tribute to your mother-in-law. I’m sorry for your loss. What a blessing that you have such a beautiful piece of work to remember her. I am so sorry. But your story is a lovely and loving tribute to Vida. We are remembered best by specific details, the examples shared and passed on. You did a beautiful job. Sounds like this special lady will be very much missed …. but what a lovely family memory you share – one of many no doubt . What a clever lady. I am very sorry for your loss. Beautiful post! It sounds like you have a beautiful relationship! Families are so important! I think I’ll love and cherish mine a little extra today because I read your post! Thank you so much! I am sorry for your loss. What a lovely keepsake to have to remind you of special times shared. So, so sorry to hear about your loss. Lovely story about your talented mother-in-love! Thank you for sharing…bittersweet. Praying for you and yours today in your loss. I just read this…it made me choke up as I too, lost a close mother n law recently. My prayers are with you and your family! I am so sorry. What a lovely tribute to your mother-in-law. I hope you will have many such happy moments to keep in your heart. Peace be with you. I’m thinking about you and your family, my sweet. I was also very close to my MIL, whom we lost after I’d only known her for 7 years. It’s a blessing to have had that unique relationship. So sorry to hear your news. Condolences to your family. So sorry for your loss. Thank you for sharing such a special memory with us. I’m sorry for your loss. That is such a beautiful memory to have, though. What a lovely memory to treasure. I am so sorry for your loss. I will keep you in my prayers. Sending thoughts of peace & healing to you & your loved ones. I’m sorry I only just saw your post. Vida sounds like she was a wonderful person, and so are you. My sincere sympathy, and hope that your terrific memories help in your healing process. Oh, Katherine…I am so very sorry for your loss. What a lovely story to remember her by….sending LOVE. Nice that you have such good memories. Sorry for your loss, I can tell Vida meant a lot to you and I wish you comfort during this time. A beautiful memory to keep with you. Oh, what a precious memory. I’m so sorry for your loss. I didn’t see this before today. sending you lots of love and sympathy, what a dear story, one to cherish! I loved this story. What a wonderful thing to remember every time you use her gorgeous tablecloth. I am so so sorry for your loss, what a beautiful story and a beautiful way to remember her. Thinking of you. That is such a funny story. I’m so glad you have this table linen with your mother-in-law’s handwork to bring you fond memories. These are the things we take comfort in. Wishing you all the best. My prayers go out to you and your family. I’m so sorry for your loss. What a beautiful tribute for your Mom-in-law. What a lovely and sweet honor and tribute. Beautiful embroidery! Wishing you the continued blessings and comfort of friends and family! That was such an amazing story and the cloth is just beyond perfection, a true beauty of a very, very talented person-in-crafts. So sorry for your loss. It is a beautiful tablecloth. The table cloth is a precious heriloom to pass on in your family, a connection to your Mother-in-Law and her memory. It is beautiful. Thank you for visiting my blog and liking it!